Our Girl's Academy program continues to evolve and grow both in the number of teams and opportunities offered as well as the recruitment of high level coaches. Your generosity has enabled us to support players like Eva Kellner and attract coaches like Annie Eckstein and will continue to help DUSC girl's development. 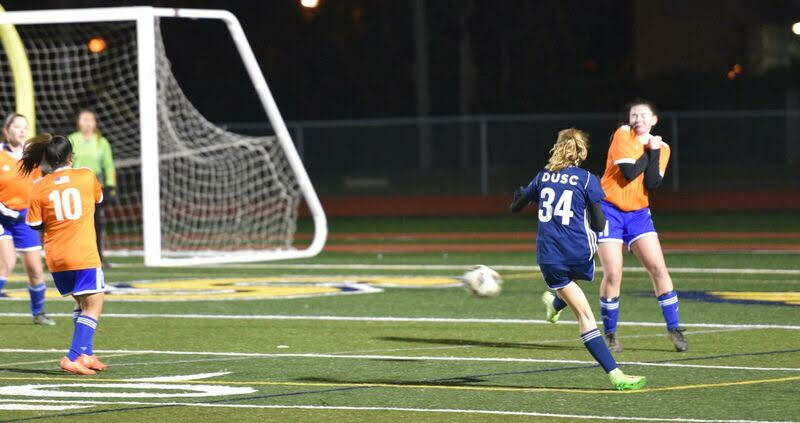 15 year old Eva Kellner plays Academy soccer for DUSC’s G2002 Blue under coach Annie Eckstein. Eva plays in the middle of the park as a central attacking midfielder, but her talent isn’t just limited to that traditional distributional role. 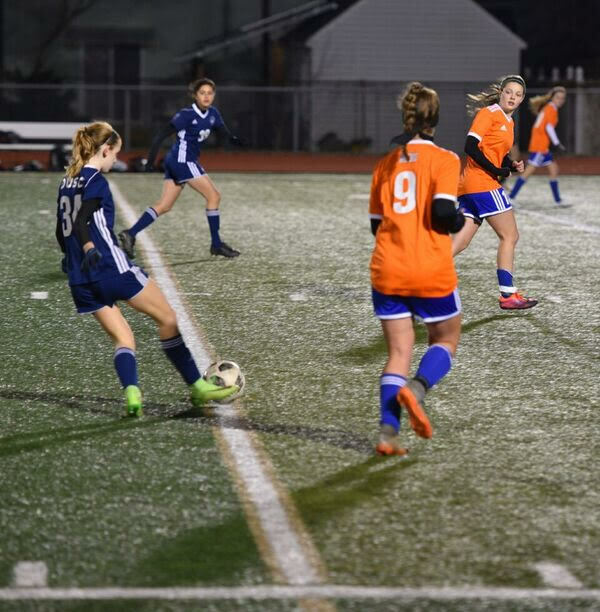 She often finds her self on the scoring end of the spectrum and proved in this Public Schools Athletic League (PSAL) season that she has quite the nose for goal. Believe it or not, Eva notched 27 goals in her 12 matches for Bard High School Early College. As a sophomore, she was the second highest goal scorer in all PSAL competition and only bested by a senior who scored 28 goals. She has been on the varsity team for her two years of high school and likewise joined DUSC around the same time two years ago. We are certainly happy she did! We sat down and chatted quickly about Eva’s experience this season and how she found the back of the net so consistently. DUSC: With 27 goals notched, can you pick your favorite from this season? Eva: My favorite goal this season had to have been against Hunter. In the game, we were down 3-0 at halftime, and then we made an amazing comeback to win the game 4-3. My goal was the equalizing goal, and though it wasn’t the most magnificent goal I had scored during the season, it was by far my favorite. The goal happened as follows: I was making a run into the middle of the field, calling for the ball from one of our center defensive midfielders. As she passed me the ball, I immediately turned and took a defender on. Once I got past the defender it was just me and the goalie. I was outside of the 18 yard box and I knew my best chance was to drive the ball to the goal. As I was sprinting into the box I knew the defender was gaining on me and that I had to shoot, but the ball was on my left foot (I’m right foot dominate). In the moment, I was a little bit unsure, but by this time it was now or never. I quickly realized that my chances of scoring would be better if my shot was towards the far post, so I did just that. I shot the ball as hard as I could and it curved in just next to the post. After scoring that goal, I felt pure bliss because not only was it the equalizing goal, but it really was a game-changer. DUSC: Did you do anything different this year from previous years that may have resulted in more goals? Eva: I think over the course of the spring season at DUSC, I really improved my touch on the ball as well as my agility. Last season I was still very fast, but I think this year my speed in combination with my improved footwork was what allowed for me to score 17 more goals from last year. DUSC: What was your biggest obstacle from this high school season? Eva: I go to Bard High School Early College, which means that starting my junior year, I take college classes rather than high school classes. Our curriculum in our two high school years is very rigorous because teachers are preparing students for the college program. This means I need to find a balance between my school work, my high school practice and games, and my club commitments. DUSC: What are you looking forward to most as you shift more focus to DUSC this winter? Eva: I’m looking forward to working on what I thought I could do better in the high school season. I think the winter season is a really good time to work on ball skill and also endurance. I am also excited to spend time with my team because we don’t all see each other much during the high school season. DUSC: Will you be trying to top 27 goals next year? Eva: 27 is a very high number when it comes to goals, and of course, I would love to top it. Let’s see what happens next season. I am equally happy to assist as it takes two or more to score. DUSC: And last, but not least…who is your favorite player? Eva: My favorite player is Dele Alli on Tottenham Hotspur. Like me, he also plays midfield, so I pay special attention to him. I think he does a really good job of moving off the ball, and though he isn’t a big goalscorer, he helps to create the plays that lead to the goal. I do try to model my play as much as I can off of him.